The Ballad of Buffalo’s Best “Batman” was published by NFB Publishing. “Buffalo’s Best Batman” is bringing his unexpected journey to the printed page with stories that will entertain and surprise many people. 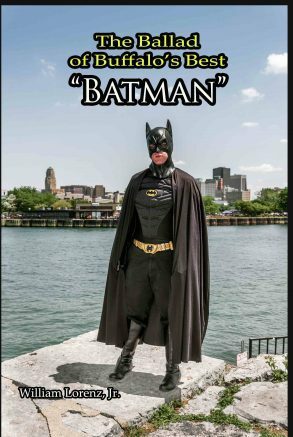 Attorney William Lorenz, Jr., who won the title of “Buffalo’s Best Batman” in 2014, has published The Ballad of Buffalo’s Best “Batman,” his first book. The attorney with the law firm of HoganWillig takes the reader through his adventures in becoming a charity superhero. Lorenz has been fascinated with Batman and martial arts since childhood, and recalls his early years of training and performing. The reader is then given a front-row seat to “Batman’s” karate performances at the first Buffalo Bisons’ Superhero Night in 2015 and at a world martial arts convention in Athens, Greece in 2018. In between those events, Lorenz recalls multiple charity appearances and the joys and struggles of balancing his work and personal life with being “Batman,” such as the time he ran into an old girlfriend’s father while in costume. This unique memoir also shines a light on the world of “cosplay,” the activity or practice of dressing up as a character from a work of fiction, like a comic book or movie. The book is filled with surprising twists and turns that would themselves feel right at home in the pages of a comic book. Fans will also appreciate that each chapter begins with a quote from one of the numerous Batman films (even The Lego Batman Movie), which sets the tone for that section. Lorenz will be doing his first book signing, in costume, on Saturday, March 23, at the Queen City Bookstore, 3184 Main St. in Buffalo, from 12 to 5 p.m. Purchase of the book for $14.95 includes an autograph and photo with “Batman.” The signing will serve as the kickoff to a week of Batman-themed events at the Queen City Bookstore in celebration of the 80th anniversary of Batman in comics. Lorenz will also be signing books in costume at the Queen City Bookstore on Wednesday, March 27, from 12 to 4 p.m., and at the Buffalo Comicon on Sunday, March 31, from 10 a.m. to 5 p.m. at the Buffalo Marriott Niagara, 1340 Millersport Highway in Amherst. The Ballad of Buffalo’s Best “Batman” is published by NFB Publishing, and may be purchased in person at the signing or through Amazon and Amazon Kindle. The book is also expected to be available at local bookstores around the area. A portion of the proceeds of every book sold will be donated by Lorenz to Mercy Flight Inc.
Be the first to comment on "Buffalo ‘Batman’ publishes first book on his adventures"